King crab is the largest of all commercially harvested crabs, growing up to 6 foot across (measured from leg tip to leg tip) and can weigh as much as 10 pounds. The world record king crab tipped the scale at almost 25 pounds. King crabs have six walking legs, a huge killer claw along with a feeder claw. The best meat from the king crab comes from the upper part of the walking legs. King crabs are found in the waters of Southeast Alaska and in the Bering Sea on flat surfaces of the sea floor. Alaskan king crab are usally found in shallow waters of 60-100 fathoms and are often found moving in herds along the flat ocean floors. Out of all the crabs, I find the king crab meat to be rich, moist and sweet. The leg meat texture is firm and the body meat is flakier. You will find that the best flavor is just after thawing. The meat is already pre-cooked so you can serve it hot or cold. If adding it to soups or stews, add it in at the very last and give it 5 minutes to get hot. 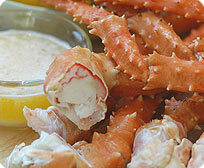 Here are more detailed instructions on cooking king crab legs.